How Much Does it Cost To Fly To Washington? The cheapest flights to Washington found within the past 7 days were $75. Prices and availability subject to change. Additional terms may apply. As you descend upon the runway in Washington, D.C., you'll notice the dignified monuments befitting a national capital. From the Library of Congress to the Lincoln Memorial and many more, the District is more than a hub of politics. When your Washington, D.C. flight touches down, you’ll learn quickly that this city is a cultural center. North and South converge and the country’s international communities celebrate with vibrant festivals, mouthwatering flavors, and unforgettable experiences you’ll want to return to again and again. Wander through the National Mall—turning back time like the pages of historic diaries and dusty ledgers as you go—and slip into a cozy whiskey bar in Adams Morgan or go glam in Georgetown. The District awaits. Flights to Washington D.C. land at one of two airports: Washington Dulles International Airport (IAD), located 28 miles west of the District, or Ronald Reagan Washington National Airport (DCA) in nearby Arlington. From IAD, you’ll be a short walk to L’Enfant Plaza Station, where a bus will connect you to the Metro for a short ride into downtown D.C.
From DCA, catch either the Blue or Yellow line to downtown Washington and explore the city’s top neighborhoods on foot or keep riding the rails. To chart your own path through the land of the free, book one of our car rental options and pick up the keys from one of the on-site rental counters at either airport. Just book plane tickets to Washington, D.C. and start planning. The Dupont Circle Hotel: Dupont Circle is both vintage and avant-garde, as this “Old City” district happens to be a charming LGBTQ community. The neighborhood’s eponymous hotel is both classic and contemporary with elegant dining options, a fitness center, and gorgeous garden views. Omni Shoreham Hotel: Staying here will make you wonder if you’ve been mistaken for a diplomat from the nearby Swiss Embassy. Take a dip in the pool, dine on the restaurant terrace, or take advantage of the location and order a picnic to take to Woodley Park. 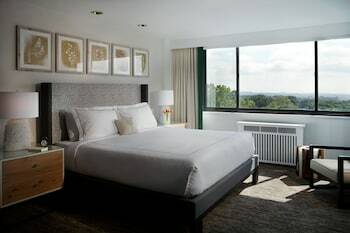 Embassy Suites by Hilton Washington D.C. – Convention Center: Whether you’re traveling for pleasure or coming to town for a conference, this hotel has all the amenities to make your stay easy and luxurious. 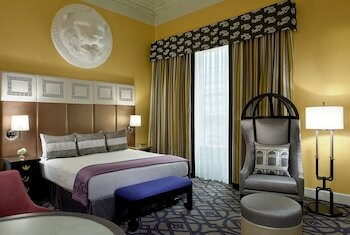 Walk a few blocks to the White House and see a show at the nearby Ford’s Theater, or join the nightly hotel reception. The Pentagon: In Arlington, near DCA, you can tour the headquarters of the U.S. Department of Defense. Although you won’t walk away with any national secrets, you’ll have quite the story to tell back home. Mount Vernon Trail: Also in Arlington, this waterfront walk meanders from Theodore Roosevelt Island to Mount Vernon, George Washington’s historic home sweet home. Sully Historic Site: Directly south of IAD in Sully, visit the plantation where generations of the Lee family, including the Confederate general Robert E. Lee, grew up. Steven F. Udvar-Hazy Center: Directly south of Dulles in Chantilly, this museum is the perfect opportunity to learn about the history of aviation before boarding your plane home. It’s time to explore the many sides of America in the bright and bustling capital. Book the cheapest flights to Washington, D.C. with Travelocity, thanks to our price-matching guarantee, and start discovering national treasures from the moment your plane touches the tarmac. Question : Where can I find cheap flights to Washington? Answer : We know you’re looking for the best flights at the lowest fares, so we found some of the sweetest deals in town just for you. Check out the top flight deals to Washington. Act quickly and score yourself a bargain! United has a flight from to Washington departing on 5/10/19 and returning on 5/14/19 all for only $117.00 per person. * Book these United flights! Frontier Airlines has a flight from to Washington departing on 5/10/19 and returning on 5/14/19 all for only $127.00 per person. * Book these Frontier Airlines flights! United has a flight from to Washington departing on 4/30/19 and returning on 5/3/19 all for only $133.00 per person. * Book these United flights! Question : What are the most popular airlines that fly to Washington? United Airlines Flies 686 flights per week between and Washington. Delta Air Lines Flies 680 flights per week between and Washington. American Airlines Flies 422 flights per week between and Washington. 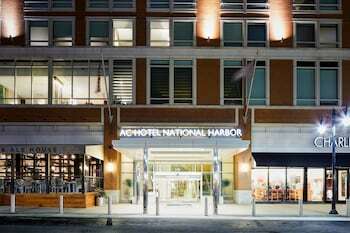 Question : Which hotels are located near airports or major attractions in Washington? Answer : We've put together a list of hotels in Washington close to airports and popular sights to see. Check out the hotels below. All of them are within proximity to must-see attractions and major airports in and around the city of Washington. 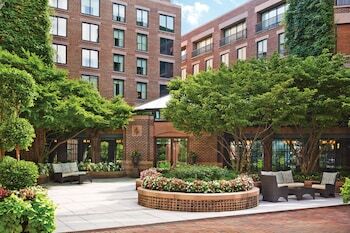 The Fairfax at Embassy Row, Starwood Luxury Collection: This Washington, DC luxury hotel is in a shopping district, 2 blocks from Dupont Circle, 4 blocks from Georgetown, and 1 mile from the John F. Kennedy Center for the Performing Arts. This hotel has a 4.50 star rating. Club Quarters in Washington DC: Club Quarters is in a prime location in the center of the business district, and two blocks from the White House and key government buildings. A short walk to Lafayette Square and the monuments and museums, including the Smithsonian. Minutes from Georgeto This hotel has a 3.50 star rating. Washington Plaza: Ideally located on Thomas Circle, near Massachusetts Avenue in the heart of Washington DC, this Kennedy-era hotel is 0.3 miles from MCPherson Square Metro Station and 0.7 miles from the Smithsonian Museums. The White House is 6 blocks from the hotel. This hotel has a 3.50 star rating. 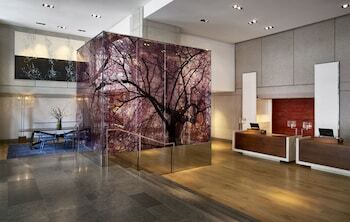 Crowne Plaza Hamilton: This hotel is 5 blocks from the White House and 8 blocks from the National Mall. The Washington Monument, National World War II Memorial, and Vietnam Veterans Memorial are all about a mile away. This hotel has a 3.50 star rating. Question : What are the top attractions in Washington? Answer : Washington has over 405 points of interest for you to choose from. 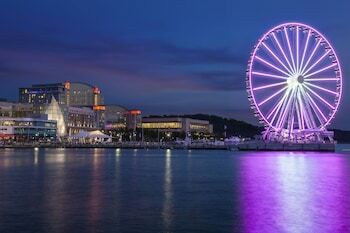 We suggest checking out Maryland Live Casino and Merriweather Post Pavilion first because they are the most popular attractions in Washington. Don't forget about other highly recommended spots like Arundel Mills Mall, Columbus Circle, and Potomac Mills. Get out there and see what the city has to offer on your trip to Washington! The Hamilton did their best as they were undergoing a major remodeling but just the same they were very helpful. Room was very nice and comfortable. Bargain price with great service. Safe neighborhood. Not as close to DuPont Circle as advertised but good location.